In the mid 1800s a wealthy lady might easily spend twelve hours of every day in her nightclothes. Indeed, she could spend weeks inhabiting her boudoir and dressing room, casually attired in her most comfortable garments, her meals brought on a tray. Young and old, there were countless reasons (genuine, imagined, or feigned) for such behaviour: headaches, pregnancy, ague, rheumatism, &c. However, depending on the lady, she may have also desired to receive guests, check on the governess and children, play the piano, or other tasks that would have allowed her to be seen within the house. Indeed, women in confinement would walk in their gardens, cut flowers, and get exercise in their nightclothes. Therefore, the clothing options included more than just a nightie and a bathrobe, and this article will examine the various garments. Note: Up to about the middle of the century, anything worn in the bedchamber usually had a “night” prefix, by the early 1860’s “sleeping” and “bed” in regards to clothes crept into the lexicon, as in sleeping gown and bed-jacket. 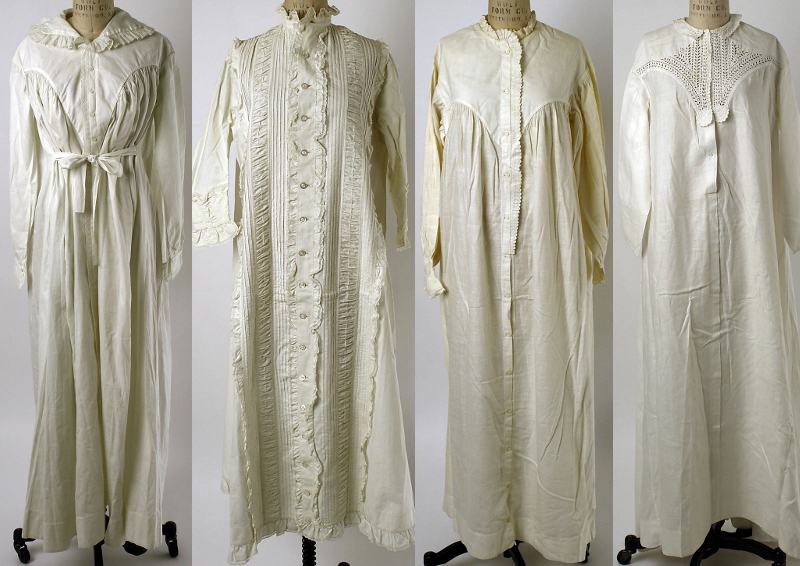 Nightgowns, 1821 to 1863, made in Europe and America. Nightcaps from the mid 1800s. The nightcaps were generally simple bonnets, similarly crafted of different material and weight for the changing seasons. A truly ill woman might retain her nightcap all day, but usually it would be removed upon rising and, after the lady’s hair was properly arranged, a small lace cap donned instead. If stepping into a private garden, a sun hat or bonnet put on top. 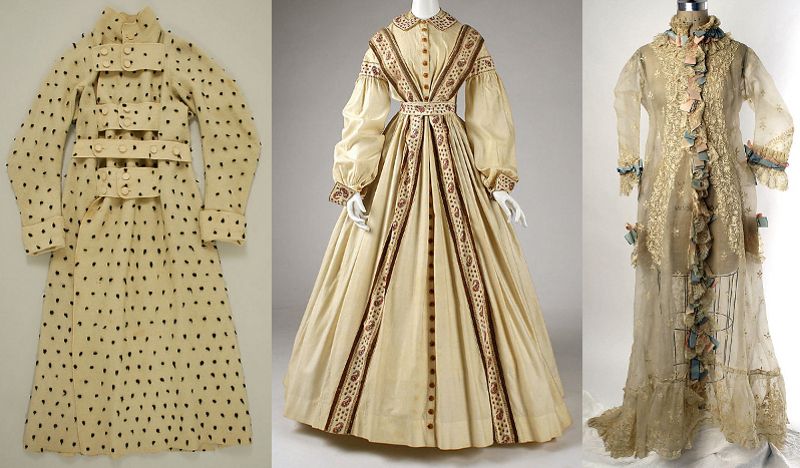 Night-jackets from 1860 to 1880. I found patterns from as early as 1820. For cooler weather or just convenience, the night-jacket was added, or sometimes worn upon rising. These were waist or hip length, started off being very much like a shirt, but by 1850 were crafted more like a little jacket, made of soft warm material, and perhaps embroidered and trimmed with ribbons and lace. They were sometimes fitted, but loose enough for free movement while sleeping, and featured cues from the changing fashions, like pagoda sleeves, or military cuffs. This garment became quite fancy and a status symbol by the late Victorian era, and generally known as a bed-jacket. A lady having breakfast in bed would sit up with her jacket on, and perhaps add a lace shawl, and this would be the same for when she was ill, to read, knit, &c, or receive callers. Along with her nightgown and cap, a lady might sleep in silk hose, wool stockings, and drawers. (There were pockets crafted that could be tied into the crotch of drawers, suspended from the drawstring front and back. In the pocket would be a handkerchief or some kind of absorbent wadding.) Upon rising she would put on velvet, cloth, leather, or sheepskin slippers, and she could select dressing gown, wrapper, or peignoir, which were names for what we today would think of as a bathrobe, but there were differences. A British dressing gown circa 1830, an American wrapper circa 1860, and a French peignoir circa 1870. 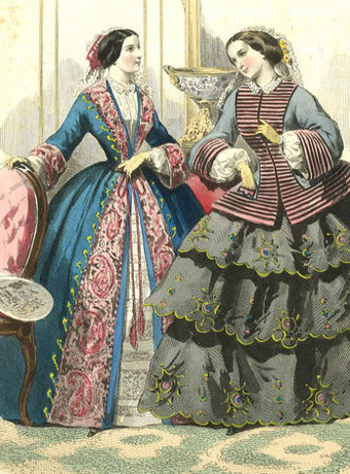 A rare fashion plate from the 1850s showing a lady ‘at home’ in her wrapper, receiving a guest. 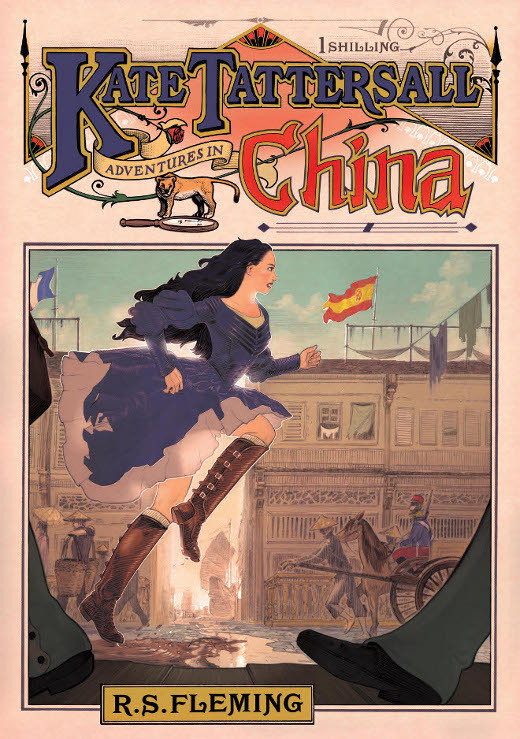 She is obviously turned out in very fine clothes, the bodice and lace-work petticoat visible beneath a brilliantly coloured embroidered and trimmed robe, with engageantes and kidskin gloves. Dressing gowns were relatively simple, but by no means plain, and worn over bedclothes, undergarments, or nothing, particularly useful for bathing. This article would have been the most common and versatile of the three. Wrappers were usually quite ornate and designed to be worn over a complete set of undergarments including crinolines, and tailored to fit like a dress, accentuating shoulders, bosom, and waist. They were sometimes open at the front of the skirting to show off decorative petticoats beneath. Petticoats and crinoline covers were specifically crafted with a triangle of lace for this purpose. A lady might wear her wrapper as far as the breakfast room and still maintain respectability. Peignoirs were a little different, and became somewhat racy. The word literally means comb in French. It was a lightweight (often chiffon) robe worn over night or day clothes while a woman prepared her tresses, or more likely had them prepared by her maid. It would catch the loose strands of hair, and any excess powders or pomades applied. The word started to be misused in Britain around 1835 as a fancy term for a dressing gown or bathrobe, and by the end of the century sometimes included long gloves and stockings of the same material for occasions when a lady might be seen in her nightclothes, such as visiting family or friends, and during travel. Remember, even the palaces of Britain had shared bathrooms and water closets. Such a sheer outfit with nothing underneath probably led to many exciting boudoir adventures. Indeed, the boudoir jacket that appeared late in the 1800s was a combination of the peignoir and night-jacket, usually being short, lacy, and tailored to follow the curves of the torso. Of all the garments covered in this article, Kate Tattersall listed her night-jacket the most frequently, adoring the soft wool (cashmere) and pink satin trim. She took it with her on many of her travels. The luxurious garment was a gift from her stepmother. Please note, there are countless museums that provide excellent examples of these garments. For ease of photo credits, the images used in this article are all from the Metropolitan Museum of Art, New York. Of interest, men’s nightcaps were long and pointed, with the end being drawn down and used as a scarf in cold weather. For a condemned prisoner it acted as a hood to hide their face during hanging. After prayers were said, the hangman would pull the nightcap down to cover the person’s entire head. Women could wear a bonnet with a veil. In both instances, male or female, it depended on what an individual could afford. The truly poor were hanged with their faces exposed, the jeering crowd watching the details of the agony. Starting in 1850 a white linen hood was provided by the London prison authorities, and it quickly became standard practice throughout the Empire. I would love to have a cashmere night jacket. I’ve read that stocking caps were actually long socks that got stretched so bad that people wore them on their heads. Imagine some one being executed with a brightly colored striped stocking pulled down over their face. I wonder if that happened? Interesting stuff. I guess hanging around all day in pjs isn’t new! But it isn’t as elegant anymore. I like having breakfast in my pjs. I’ve got to get a fancy bed jacket! There’s certainly a lot to learn about this topic. I really like all the points you have made. Im a real romantic… poet and musician … love victorian ladies in their granny nightgowns and bed bonnets……I write little poems and stories inspired by them! Yes, search online, or hire a talented tailor and have something custom made.